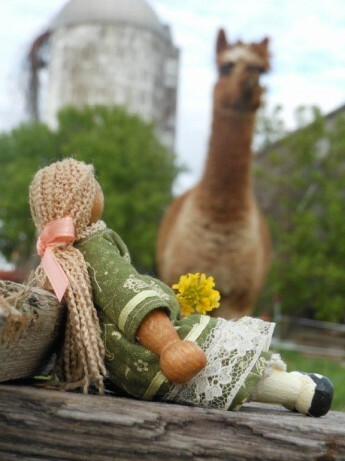 The clothespin doll, Farmer Andy, has been traveling with Bill and Kathy Brown in their work with the Fellowship of Christian Farmers, and he will now be joined by his sister Fanny. Together they are traveling to farm shows and events with the FCFI crew to share the story of the beads with all who come by to listen. The Gospel radiates, a light that shines in a dark place, offering peace, forgiveness and hope. Here are some pictures taken at local shows in the month of June. See more about Farmer Andy posts. And visit the FCFI website. 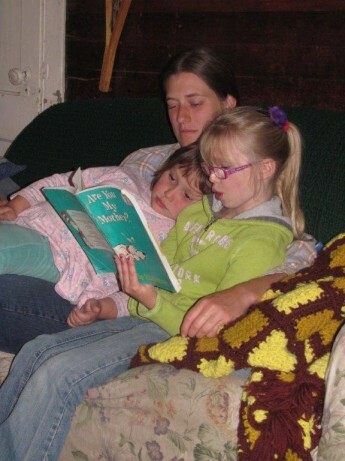 Cathy Upson, member of the Mohawk Valley chapter using “Fannie” Farmer Andy’s sister to share the Gospel at Dryden, NY. 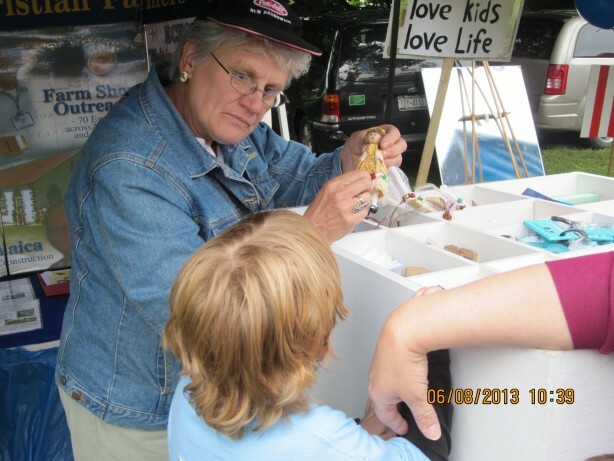 400 people stopped by on June 8, 2013. Cathy using Farmer Andy for witnessing. 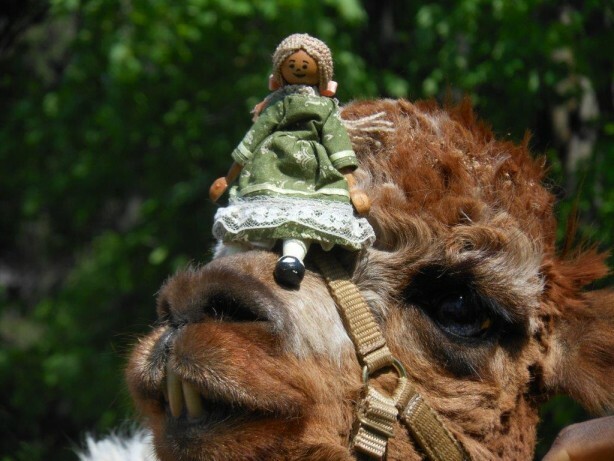 Both Farmer Andy and Fannie will be traveling all summer with the Browns to FCF events. 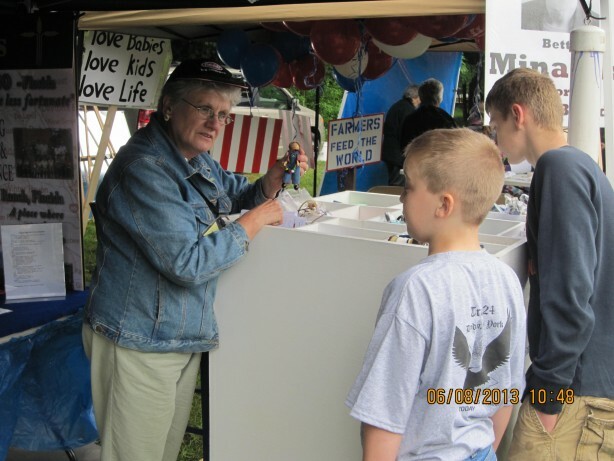 David Sanford sharing the gospel using Fannie at the Strawberry Fest, Owego, NY on June 14-15. 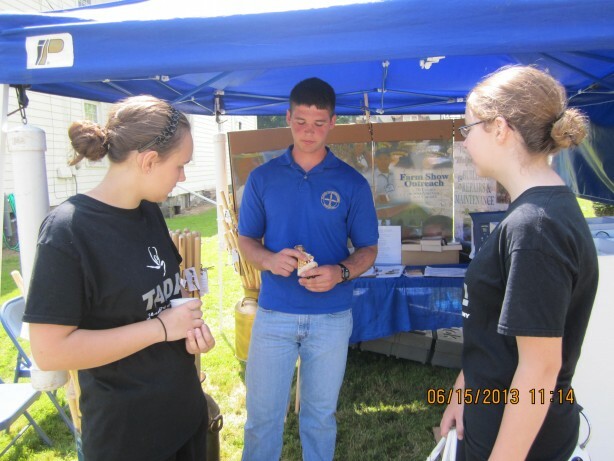 500 people stopped by and 3 received Christ. 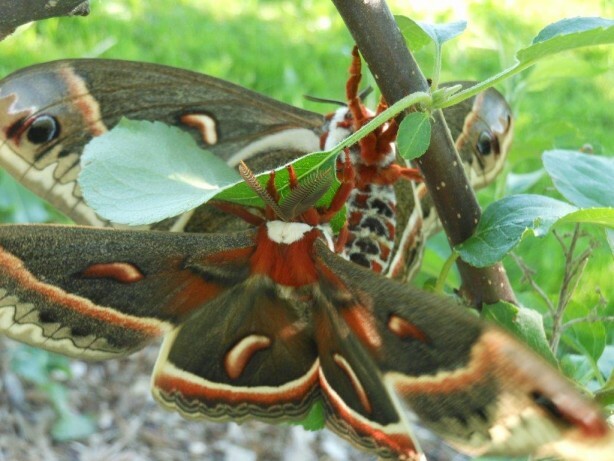 We had such a treat recently when Mom found this beautiful cecropia moth on one of our apple trees. 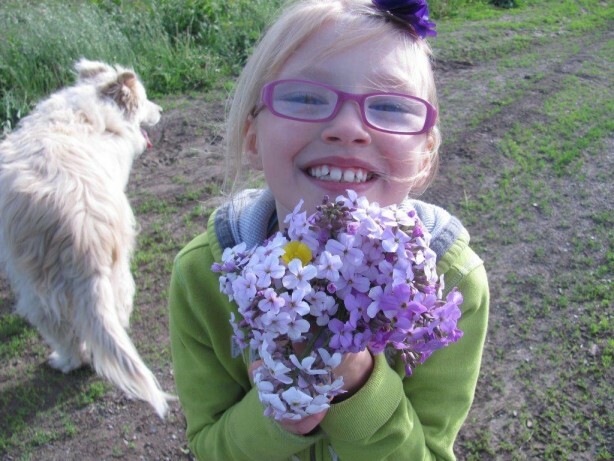 They are familiar to us because Abby has a hobby of collecting moth cocoons and hatching them in her window. 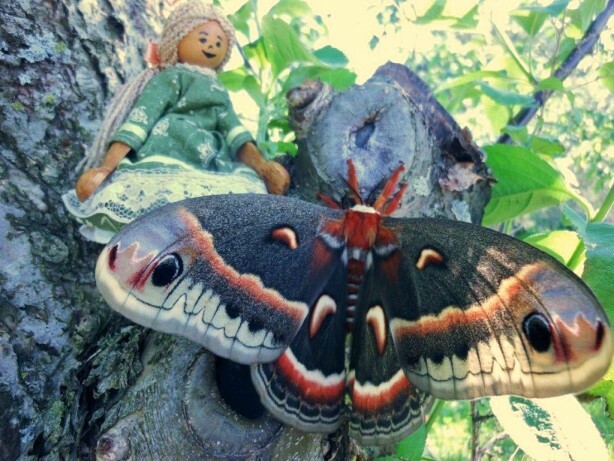 This is the Cecropia Moth (Hyalophora cecropia) and is North America’s largest native moth and can have a wingspan of six inches or more. I didn’t think to measure this one, too bad. She had just emerged from her cocoon, a tough fibery home where she spent the winter. June is the month of moths, and time for her to emerge. An apple tree was a good choice to winter near, because when her offspring are born they will feed here on leaves they like. I looked around but was unable to find her cocoon as it was well camouflaged. When these moths emerge from their cocoons in the morning, the wings are small and wet and hard to distinguish. When she finds a good resting place, she will begin to work her wings around to stretch them and enable the blood to pump into them. As she does this, the wings will gradually spread to their full size and dry out. She will rest a bit, then work her wings around some more til they are in full display – so beautiful! 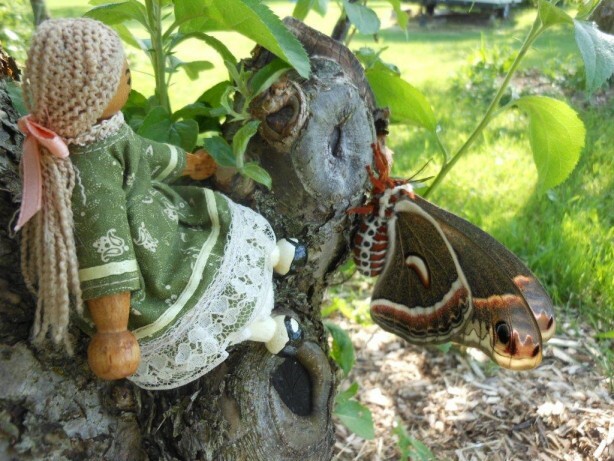 Yes, this moth is bigger than Penny! Look at the amazing design of those wings!! Here is a close up of the body and red furry legs. Notice the fern-like antennae. 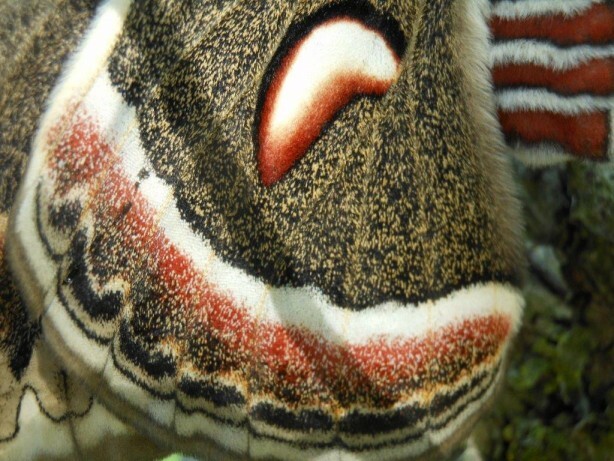 These scales on the wings are like fuzzy hairs. Those eyes are compound eyes, made up of many hexagon lenses, that all collect light for seeing. The antennae are the radars that detect scents and gather information about her world. They also are used for balance and for orienting her when she flies. Can you see her mouth? Butterflies have a tube that curls out to drink nectar like a straw. 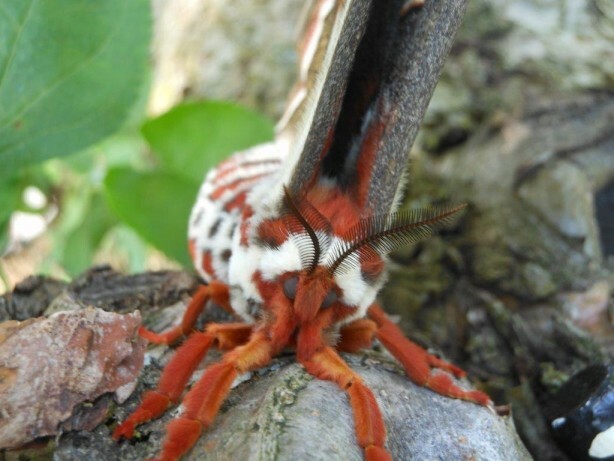 But these moths have no mouthparts and do not feed, as she will only live about two weeks, long enough to mate and lay eggs. Penny is enjoying her perch so near the moth and seeing her spread, then fold her wings. It was windy that day too, so the wings were fluttering in the wind at times. The next day I checked and there she was yet, now with a mate! 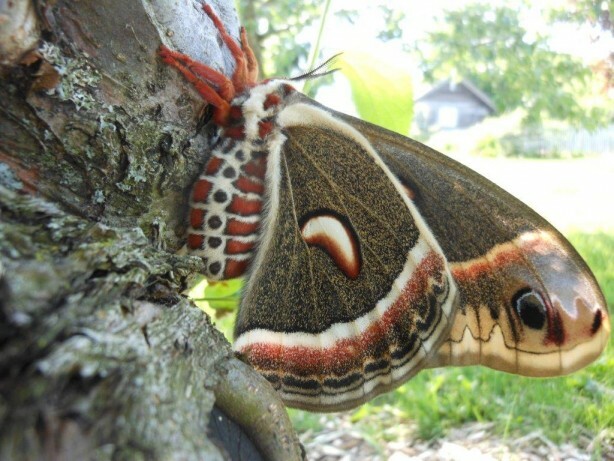 After the female is out of her cocoon and her wings are dry and full, she will produce a scent called pheromone. 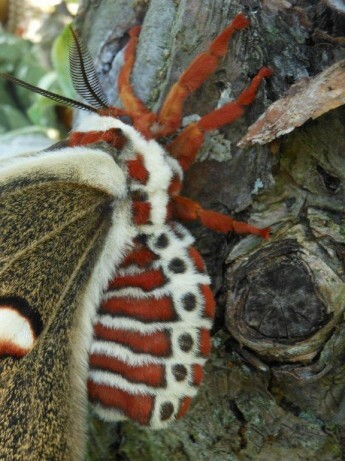 A male moth can detect that scent from miles away. Amazing. You will notice that his antennae are much larger and finely “feathered”. 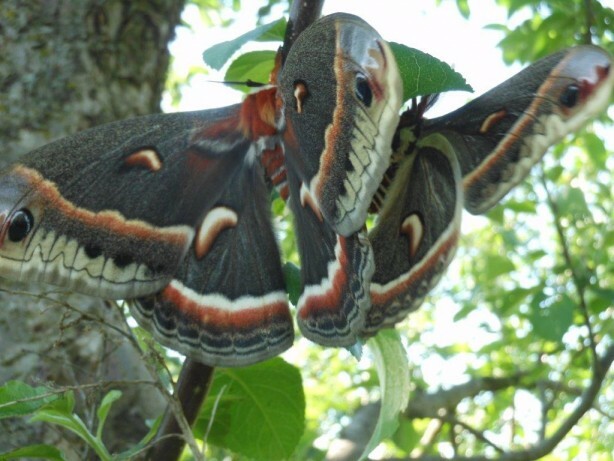 The female cecropia will lay more than one hundred eggs. She will lay them in small groups on the underside of leaves that will be food for the little ones when they emerge. She will fly a short distance to lay others so they will not all be too near. The caterpillars will hatch in one to two weeks, they will be black and tiny as a mosquito. There are so many because they will not all live to grow up. As they grow the caterpillars change from black to yellow to green, and when they are five inches long, fully grown, it will be time for them to spin their cocoon and continue the life cycle of the adult moth next spring. 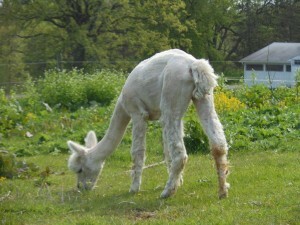 This is Snufflesworth, my white alpaca. 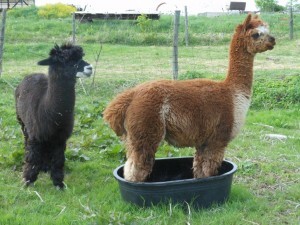 Zorro is the black, shy little fellow; Norman is the pretty brown alpaca who thinks he is boss. 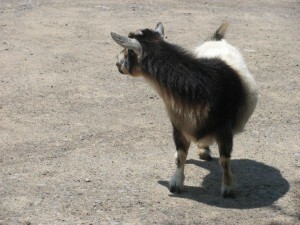 Little Goatly is really in charge. She is a full grown Nigerian Dwarf / Pygmy cross. Here she is checking Penny out. 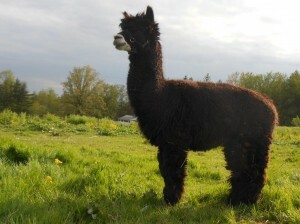 Zorro has a full coat of very fine alpaca hair. He once won ribbons in show. Here, Norman’s teeth are sticking out of his cute teddy bear face. 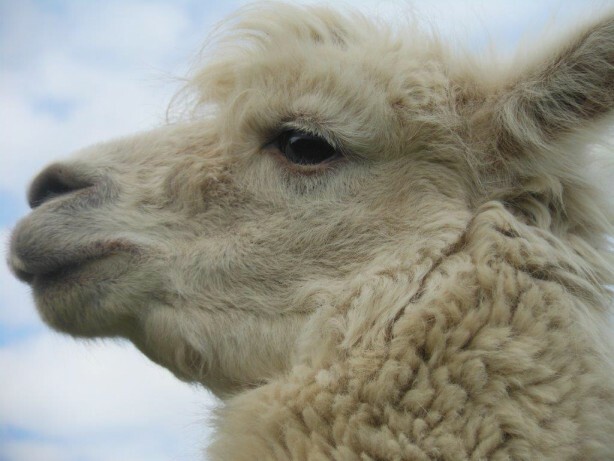 When alpaca’s chew, their lower jaw rotates in a figure 8, the upper lip is divided in the center, and the left or right lip can move separately. 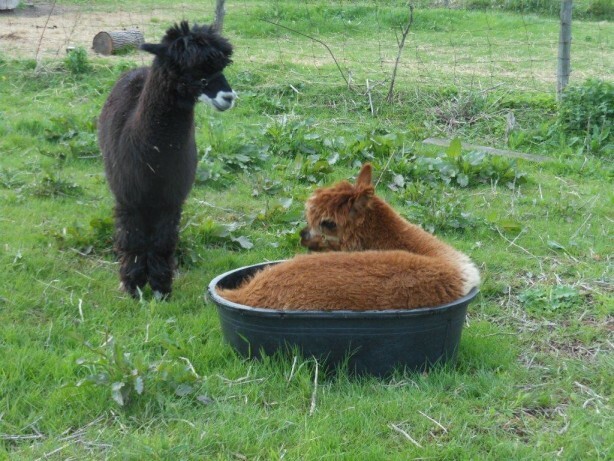 We found them quite hilarious to watch when we first got these unusual creatures. Their coats are full and soft, after a full year’s growth. 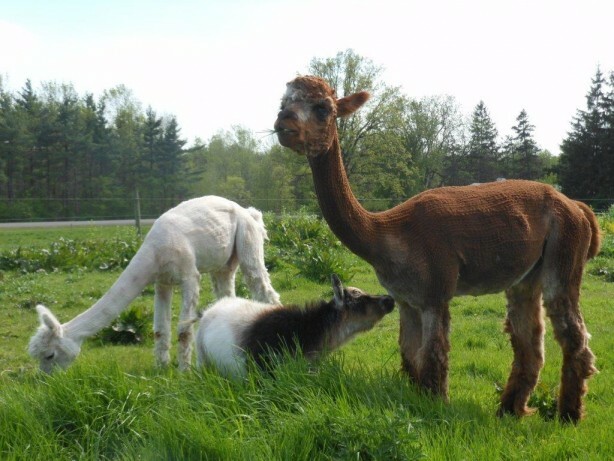 Now its May and that means shearing time!! 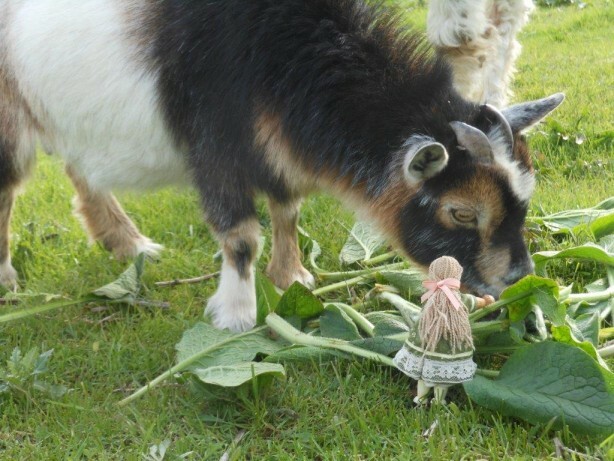 Here Penny is feeding comfery herb to them, Little Goatly must get her share first. Norman loves his bathtub. Here is a series of pictures showing how he first splashes in the water, then sits in it, then squeezes his whole body into the tub, till the water nearly overflows! Such a funny sight! Kind of like a big soft teddy bear squeezed into a tea cup. 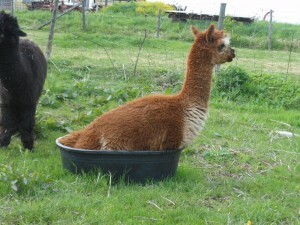 There is a shearing crew that travels about to the alpaca farms for the big event of Shearing Day. 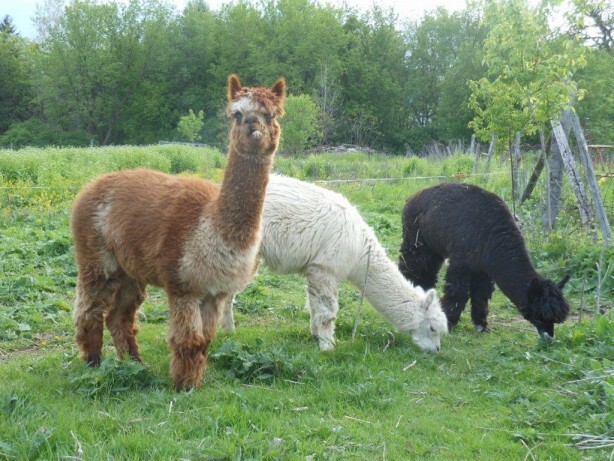 Since we only have 3 alpacas, we load them into a trailer and haul them to a nearby farm to wait their turn to get sheared. 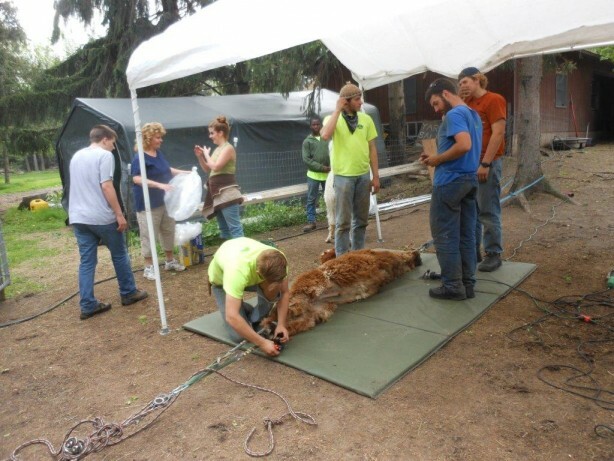 This style of shearing uses a mat and bungy cords to hold out the animal’s legs so they can be easily rolled over in a smooth and comfortable way. These young men really know what they are doing and are very quick about their job! 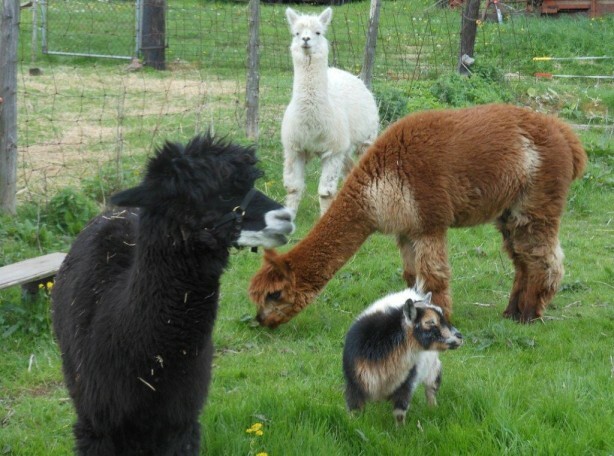 After our alpacas were loaded up from our farm and headed away down the driveway, poor Little Goatly wandered all around the farm bleating, looking for her missing companions. Here she is in the driveway, on the saddest day of her life. So forlorn. Notice in this video as they shear, that the hair is separated into bags, 1st is the best hair, called the blanket fleece. In the bag labeled #2 is seconds, from the neck and legs. Thirds are the scraps of odd leftover hair. 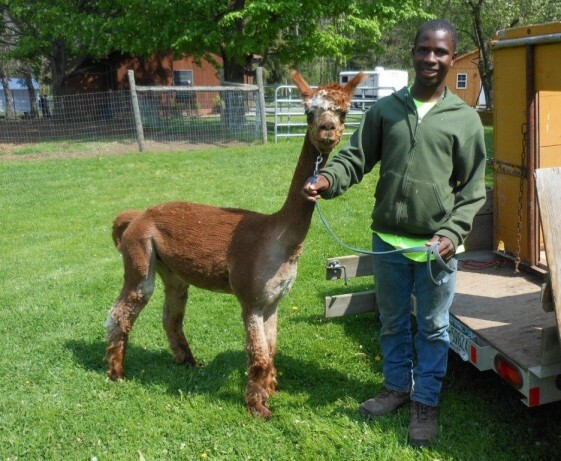 That’s Amadu, our friend, holding a scrawny, shrunken alpaca!! 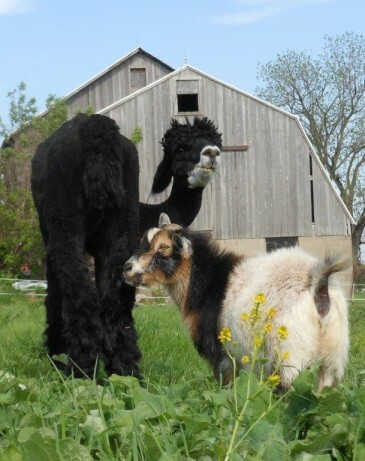 Home again, safe in their favorite pasture! 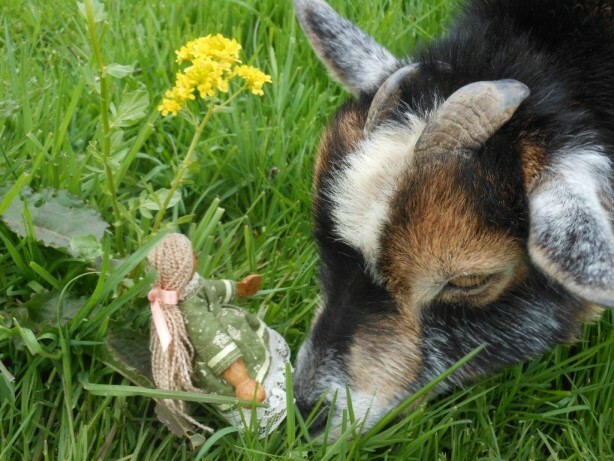 The goat eagerly sniffs them over to see if she can figure out what happened to her fuzzy friends! You just gotta laugh when you see them after such an immense transformation! 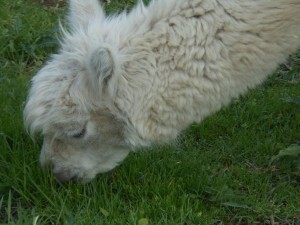 Once at home in their pasture, the alpacas like to roll in the grass, giving themselves a rubdown that feels delightful. 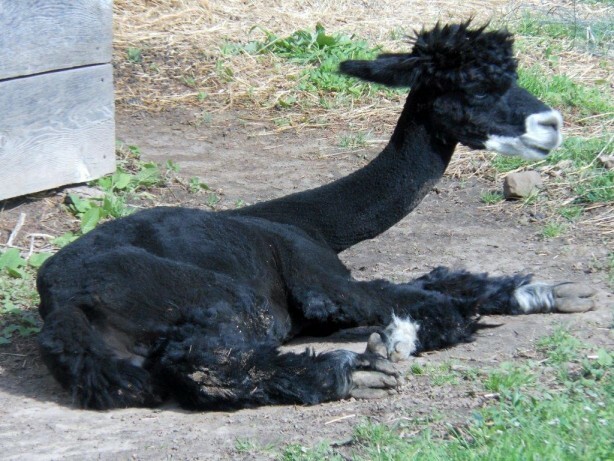 Then they stretch out in the sun and soak up some warmth! And so the hair will grow til next year when shearing time rolls around again. Now is time for me to wash, card and spin the fleece into yarn! These drawings were created by our 7 year old friend, Elizabeth, to illustrate the Bead Story. 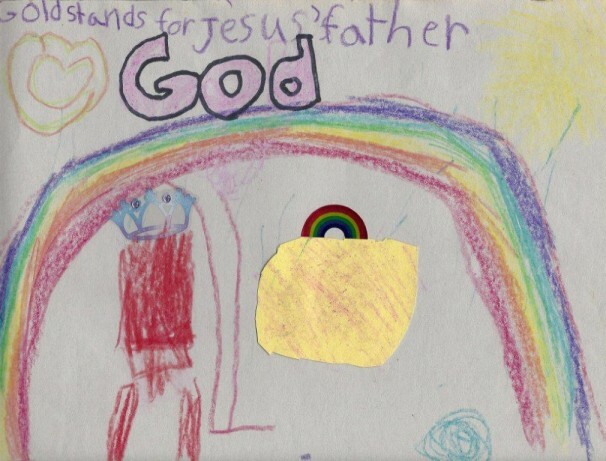 On this first page representing the Gold Bead, she says, “Gold stands for Jesus’ Father, God,” and she drew Heaven and God’s throne. That is the gold bead in the center, she colored it with the pink sparkly crayon so it would sparkle beautifully. See the glittery crown sticker over the throne? Revelation 4:3 says, ” …and there was a rainbow round about the throne.” That will be awesome to see, won’t it? Here is the Black Bead, “Black stands for Sin and Selfishness.” See the black, filthy heart? Compared to the beauty and holiness of God, we are in shame. Below is the green snake that tempted Eve in the Garden of Eden. Also there are two unhappy people, one is crying puddles of tears (in heaven God will wipe away all tears from our eyes, Rev. 21:4) and the other person is fussing because he doesn’t like his hot chocolate. 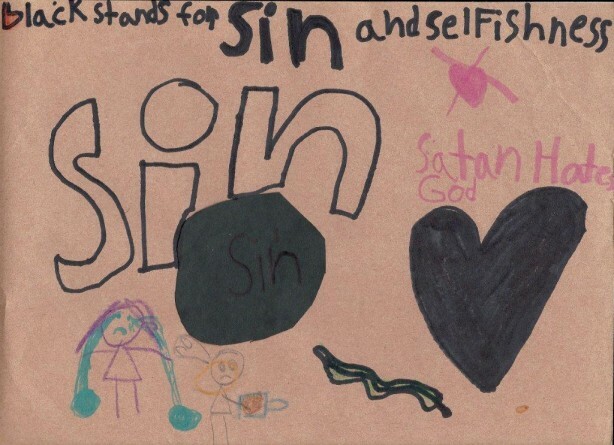 The red letters say, “Satan hates God,” his business is to lie, steal, kill and destroy. And now for the big Red Bead. 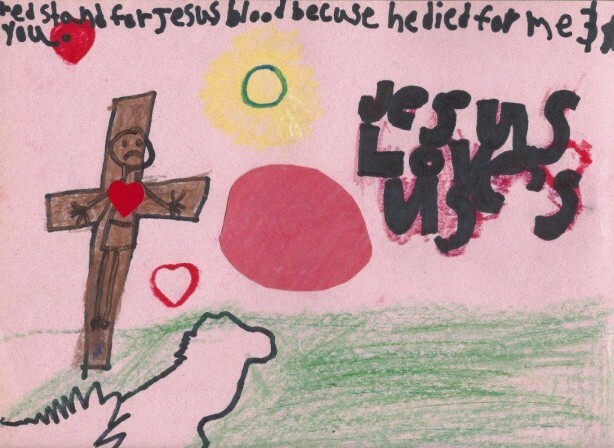 “Red stands for Jesus’ blood because He died for me & you.” There is Jesus dying on the cross to pay for our sins, to satisfy the justice of God in our place. See His heart bursting with love for us? ” Jesus Loves Us! 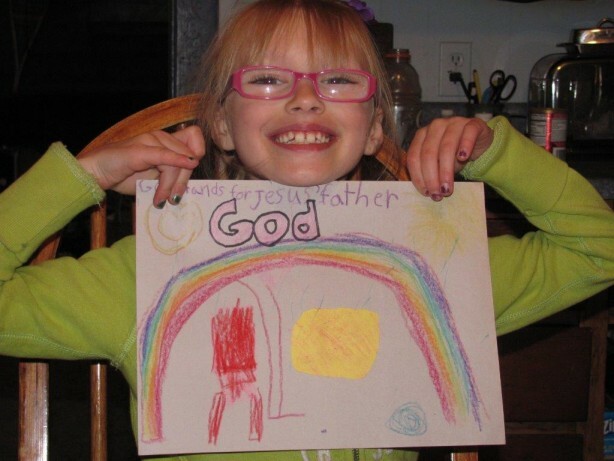 !” He poured out His life so that we could come meet His Dad. The black cracks that can be seen below the cross happened when the earthquake shook everything when He died. 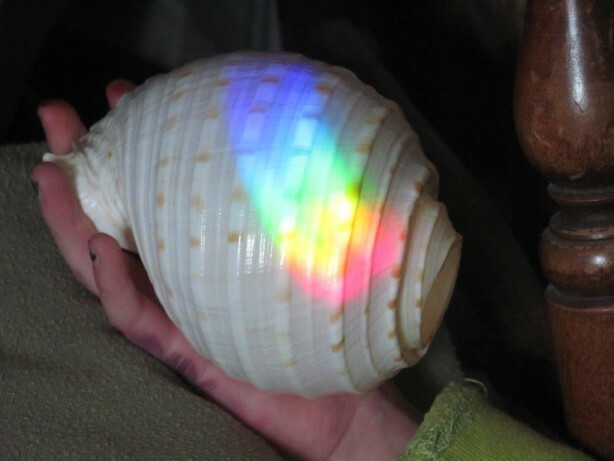 How beautiful is the story of the White Bead. 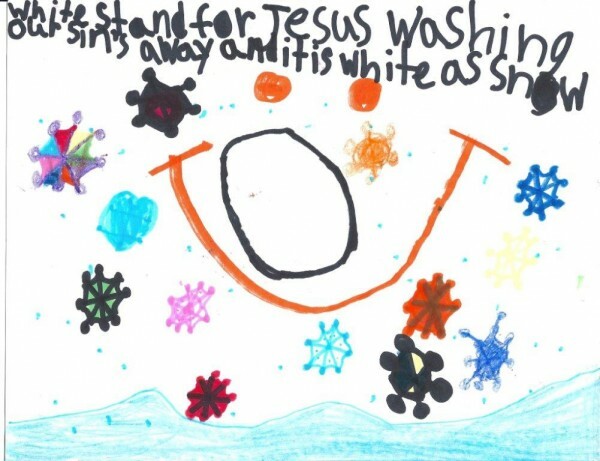 “White stands for Jesus washing our sins away and it is white as snow.” All those unique snowflakes, each one a work of art. 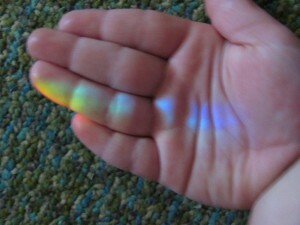 Even one like a rainbow (we girls were playing with my collection of prisms!!) 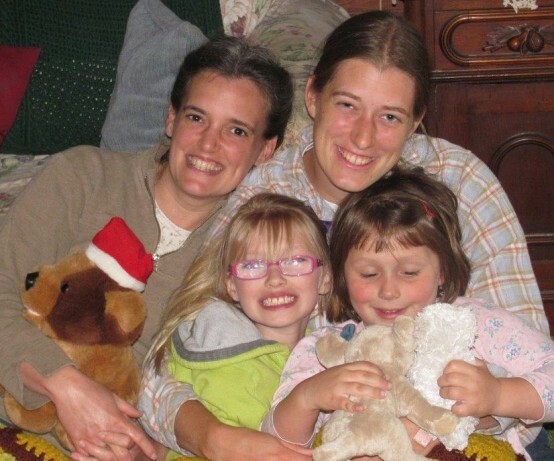 Notice what a Big Smile we have when we are forgiven! Finally the Green Bead. 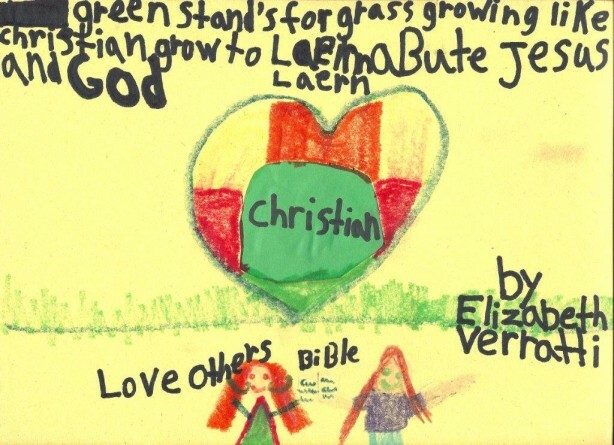 “Green stands for grass growing like Christian’s grow, to learn about Jesus and God” Christians have Jesus living in their hearts, they love others, read their Bibles, and show others what God’s love is like. 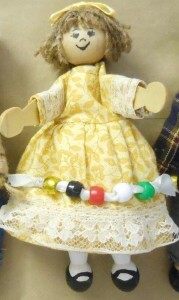 This is a string of beads cut out by 4 year old Bella, she loves to cut with scissors just her size. 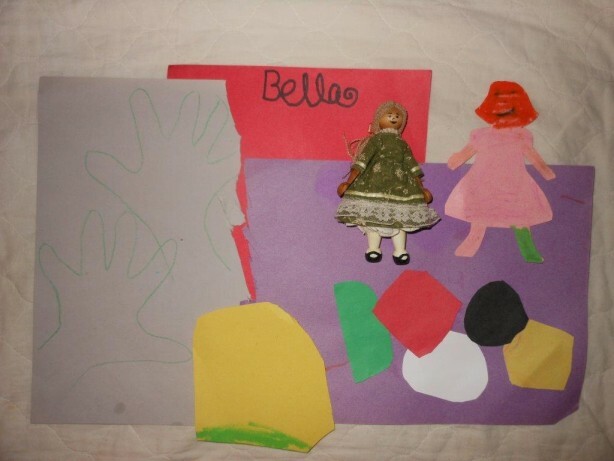 This is a collage of her artwork, her handprints, and various cut edges as she used the scissors wherever she could. 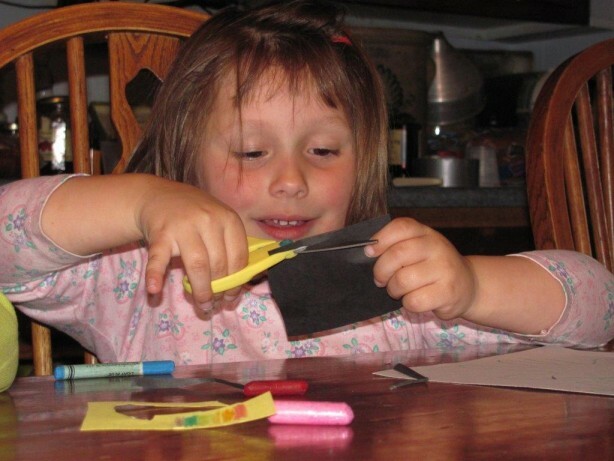 She colored in the little girl cut-out with that favorite sparkly pink crayon that got used in lots of places. 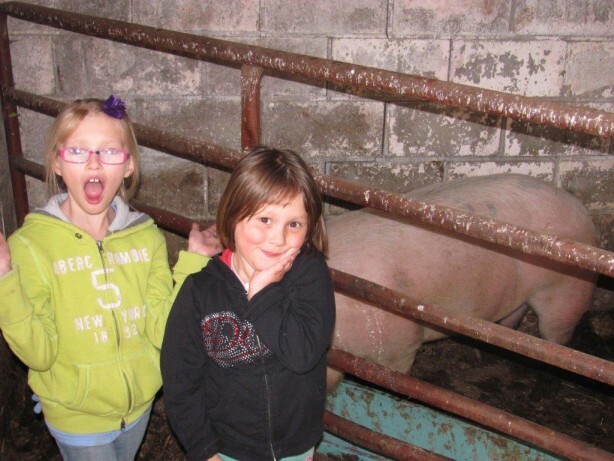 Here are some sample pictures of Elizabeth and Bella’s visit to our farm….